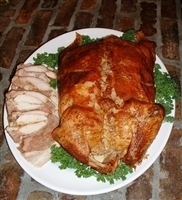 Our small turducken feeds 15 and weighs 8-10lbs. COOKING INSTRUCTIONS: Thaw 5 days in refrigeration. Remove plastic packaging. Bake breast down at 375°F for 3 hours covered and 1 hour uncovered or until the internal temperature is above 165°F.